The 19th Annual Nashville Best Cellars dinner on Monday night (April 23) featured celebrity attendees including Frankie Ballard, Big Kenny (Big & Rich), Kix Brooks, Martina McBride, Michael Ray, Dan Smyers (Dan + Shay), Old Dominion, RaeLynn, Reba McEntire, and more, and the event’s gourmet food, exquisite wines and resulted in over $215,000 raised for the T.J. Martell Foundation. At the helm of the event were co-chairs and industry staples Rob Beckham (Co-Head, WME Nashville), John Esposito (Chairman & CEO, Warner Music Nashville) and Eliza Kraft Olander. The dinner featured cuisine prepared by award-winning chefs Joseph Lenn (J.C. Holdway – Knoxville, TN), Steven Satterfield (Miller Union – Atlanta, GA), Matt Bolus (404 Kitchen – Nashville, TN) and Lisa Donovan (Nashville-based pastry chef). Satterfield introduced the first course with his vegetable-paired smoked cobia, leading into Lenn’s pork collar with potatoes, ramps, fiddlehead ferns and ham hock. Bolus followed up with lamb sugo and ricotta cavatelli, and Donovan wrapped the evening with black pepper and pecan pavolova, Louisiana strawberries and sweet cream. 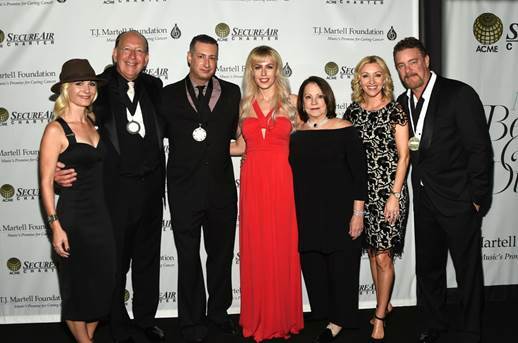 Pairing “Best Sellers” (popular chart-topping and award winning artists) with “Best Cellars” (some of the top wine collectors in the United States), the event has helped raise money to support the foundation’s mission of funding ground-breaking cancer research since 1999.